At a busy King Tuts Drenge begin their UK tour to promote their new album Strange Creatures. The show is opened by Valeras, a late replacement on this tour for the Wytches. Valeras, wild and enjoyable Indie Rock is a fitting opening act. Drenge are no longer a duo of brothers, with the Loveless siblings now joined by a bass player and a second guitarist/keyboardist. The additional musicians help to showcase the more expansive nature of the material from Strange Creatures. 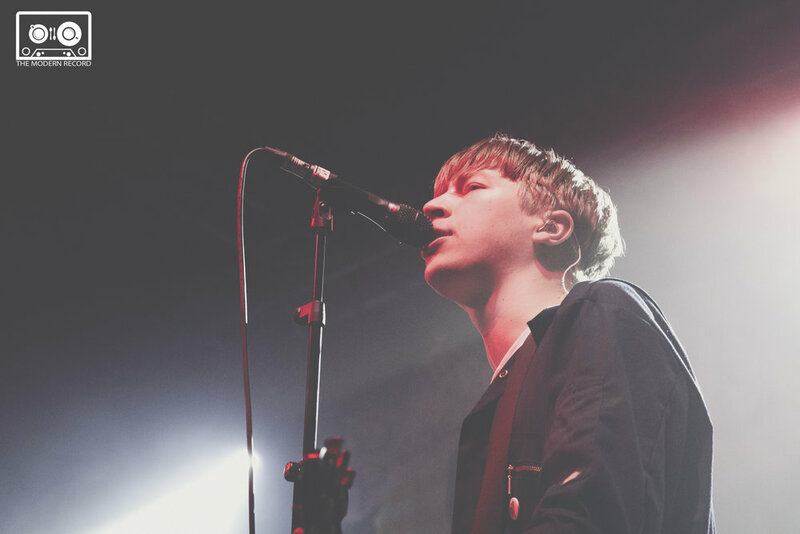 As the venue fills Drenge take to he stage, immediately playing songs from Strange Creatures. They open with the title track, it’s a striking way to begin the set with it’s superb stark gothic nature juxtaposed by an excellent guitar solo this is followed by lively run through of Autonomy, this song is much better live than on record largely due to some impressive guitar work at the breakdown of the song. Despite, excellent performances of the first two songs the audience are slightly subdued until demented blues of Face Like A Skull inspires manic pogoing and the momentum is continued with This Dance. After a slight technical issue with the guitars People In Love is meet with a triumphant sing along. However, Never See the Signs is disappointing and would be regardless of Eoin missing his vocal cue, the light hearted laugh and charming smile at this is more enjoyable than the song. The riff of Never See the Signs is uninspired and dull. Furthermore, the poppy chorus and vocal effects do not suit Drenge. Though that is the only misstep, the fun and thrashy chorus of We Can What We Want contrasts with the stoned desert rock of Running Wild, extended with atmospheric dense guitars. This depicts why we need to cherish Drenge, not only are they are consistently excellent British rock band they provide a variety that makes them engaging and unique. Proving that being a guitar based rock band does not need to limit a band creatively. This is further illustrated by the new material, Bonfire of the City Boys proving just as mesmerising live as on the album. Striking bass notes introduce this song before the urgent narration kicks in. This is an excellent vocal performance from Eoin as he talk sings while matching the intensity and ferocity of the guitars that meet him in the chorus. The main set is finished with an incendiary version of Let’s Pretend with superb drumming from Rory. They quickly return for an encore of When I Look Into Your Eyes, though they fail to fully capture the songs eccentricity live (with the backing vocals and hand claps too quiet) the frenzied Bloodsports is a great way to finish the show. A fantastic opening night to the tour for Drenge, if you are able to catch them on this tour they will not disappoint.